This trip combines the exciting activities from Sea of Cortez Safari yoga and surf themed visit to Todos Santos on the Pacific coast as well as a chance to interact with Gray Whales. Flights arrive to San Jose del Cabo which is the airport that services Cabo San Lucas. Participants are transported via 15-passenger air conditioned vans to La Paz. Trip duration is about 3 hours with a stop halfway in San Bartolo for a light snack and bathroom break. We check into hotel in La Paz followed by dinner (not included) and a time to get to know others on the group. Huge seafood lunch at the famous Hotel California. Legend has it that the Eagles song was about this hotel, but the Eagles deny it. Afternoon: Swim and relax on Cerritos Beach, one of the best Pacific beaches. We will also have the option to take some begginer/advanced surfing lessons (extra cost). Day trip to Lopez Mateos for Whale Watching at Magdalena Bay! We will depart the hotel in La Paz at 6 a.m., stopping for a bathroom break about 1.5 hours into the trip and then again for breakfast in the town of Constitucion. We will go whale watching in the morning and again after lunch! Our guides will take us into the lagoon in a 20ft panga (traditional fishing boat). You will learn about and see gray whales displaying a variety of behaviors in their natural habitat such as spy hopping, breaching and tail lobbing. The whales are accustomed to human visitors and are as curious as you are. They often come so close to the boat you can reach out and touch them. It is not uncommon for a 45ft mother whale to let her 15ft calf swim up to the boat to interact with cheerful tourists who are splashing the water for its attention. Your friends will not believe your pictures! It is important to note that each venture on the boat is different. These are wild animals and we do not chase or harass them to get close enough to touch. The probability is high that you will be able to interact with them, but can’t be guaranteed. Lunch: a huge fish/seafood veggie feast! Dinner: on your own in La Paz - though you will probably be too full from lunch for a large meal! Transfer to Island 'Glamping' Camp! We depart from Puerto Lopez Mateos after breakfast and return to La Paz. We will stop at the grocery store for participants to pick up personal supplies followed by a lunch of fish tacos downtown on the boardwalk. There will be a stop at the marina to load our gear onto the boats. The trip from Costa Baja Marina to our camp on Isla Partida (adjacent to Espiritu Santo) is 26 miles by boat. We will arrive at the beach camp before sunset. The crew will already have camp set up for us. Dinner will be served and we will settle into our home for the next few nights. In the evening we will have a presentation by a local artist, with the amazing sunset in the backround! 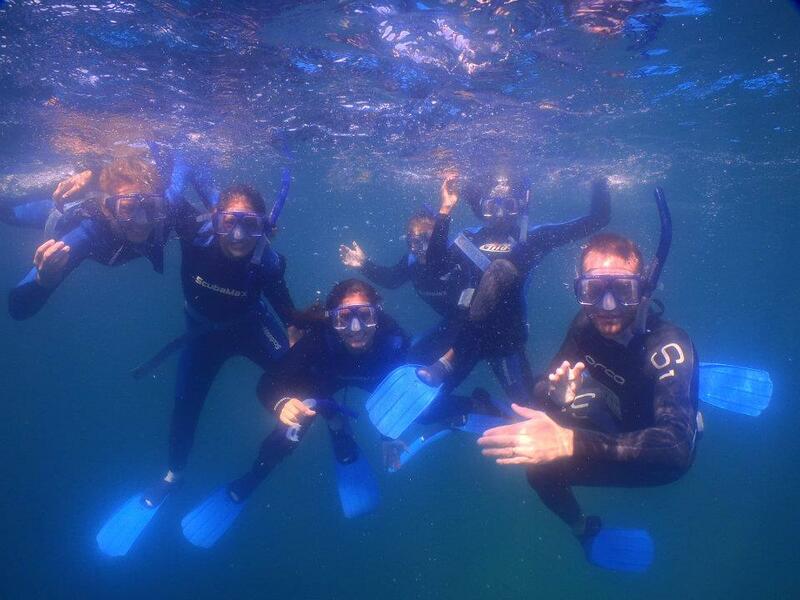 Introduction to Snorkeling at Ensenada Grande Beach & Sea Kayaking at the Sea Lion Colony! In the morning we will have an introduction to snorkeling and visit the Ensenada Grande Reef. That afternoon, participants take a kayaking trip at Los Islotes to observe the sea lion rookery. Evening activity: Reef Fish ID Presentations by group members, and drinks under a million stars! Hiking on the island, above our campsite! Morning: After breakfast we will depart by boat and travel 30 minutes south to San Gabriel Bay. Afternoon: The afternoon activity will be determined by the participants’ interests. There are dozens of other snorkeling sites and other places to hike. Those who choose to SCUBA will do so this afternoon. Two bays north of San Gabriel is El Coralito Bay. The clear, calm, sun-filled waters provide prime conditions for a very large expanse of continuous hard coral reef known as the carpet of corals. The extra cost for SCUBA diving is $160 pp plus gratuity. Discover (intro dive for non-certified individuals is $225). Evening: Introduction to the California Sea Lion: Before sunset, we will journey by boat to Los Islotes, the sea lion colony, Here participants will learn about and identify the sea lion’s distinguishing features and the role of commonly displayed behaviors. 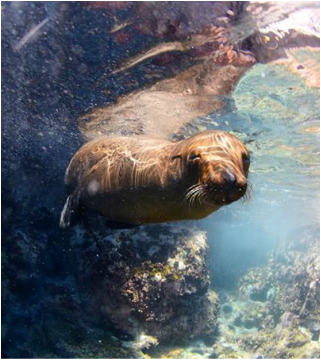 Snorkeling with Sea Lions: We will travel to the Los Islotes Sea Lion Colony for snorkeling after breakfast. Time to say goodbye to our Island - it will not be easy! On our way back to the mainland, we will look for Whale Sharks - the largest of fish - and an amazing snorkeling experience. Back in La Paz, we will be eating a seafood lunch at Bizmartcito (included). After this, we will have time to rest a bit, before heading our for our last group dinner and a night out on the town. Time to show off those dance moves! This morning we will say goodbye to La Paz, and head back to the airport at San Jose del Cabos. You do have an option of staying on an extra night in Los Cabos - and if you choose so, you will head into town. For this night, we will be checking into a the Qunita Del Sol hotel in Cabo San Lucas. Medano Beach, Cabo´s main swimming beach, and other great beaches are just a short distance away. And so is downtown Cabo San Lucas - with its cheesy restaurants, bars and nightclubs. We will spend a chill afternoon by the pool, beach, bar or souvenir shopping, and will end the day with a festive meal, serenaded by a Mariachi band. Later, we will go out and taste some of the nightlife Cabo is famous for! Time to head back home (for those staying the extra night) - you will be taken by shuttle to the airport depending on the time of your flight home. **Please note that the time and location of an activity might change due to unexpected circumstances, such as inclement weather and hazardous road conditions. Our chef team preparing a gourmet dinner! Chilling on our private island beach! Ami Greener, our director, about to dive near Esperitu Santu Island. The Baja Safari trip will take place from Saturday, March 12 to Saturday March 19 ,2016 (7 nights in total; 8 nights for those wishing to stay the last Saturday night in Cabo San Lucas). We will be meeting at and leaving from the San Jose Del Cabo international airport (SJC). We ask that you plan to be on a flight that will land in San Jose by 2 pm on March 12. Your flight should be after 2 pm on Saturday, March 19, or any time on Sunday, March 20 if you stay the extra day. If you want to arrive a day or two earlier, or choose to leave later, please let us know how we can help you experience more of this magnificent peninsula. We can arrange for a pick-up or drop-off in another part of Baja Sure at the beginning or end of the trip. If you are interested in this option, please let us know! Participants wills stay in this 3-star hotel for the first two nights and on our last night. Forget “roughing it” as this camp is remote without the feeling of being limited. You know how when you hike for a week you only eat what you carry in? Not during this adventure! Supplies are brought in daily. There is refrigeration and cold storage and a chef to prepare your meals. There is even a blender for margaritas and a generator to charge your camera batteries! You will arrive to tents already set up. Participants will stay four nights at Camp Sea Quest on Isla Partida, located on the northern portion of Espiritu Santo Island. The beach camp can accommodate up to 25 participants. Tents have two cots, two sleeping bags, two sets of sheets and pillows and a bath towel for each participant. There is a full kitchen and cooking staff. There are two flush toilets with privacy walls, T.P and hand sanitizer. There are two enclosed single solar showers for bathing. 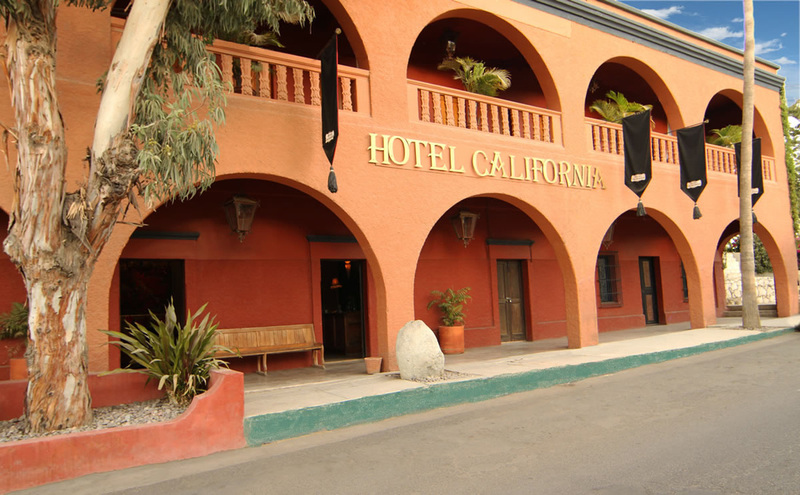 Participants will stay double occupancy in this charming hotel right in the center of Cabo San Lucas. For your Baja Sur safari, you will be accompanied by a professional bilingual guide from Fun Baja , one of the top adventure companies in the area. A Greener Travel staff-person will also be escorting the group for the length of your trip. In various activities, we use the best local specialty guides with years of expertise in introducing visitors to the natural beauty of Baja Sur. We work mostly with local guides as well as with tourism non-profit organizations , which make sure that the local indigenous communities benefit from tourism revenues while protecting the environment and the traditional way of life. We provide all land and marine transfers during the week using an air conditioned van or minibus., as well as the airport transfer on the last day. Before departing, you will receive a comprehensive list of suggested things to bring on the trip. Lightweight clothing and footwear is the norm but it does get cool at night an in the mornings. You will need a warm fleece jacket for cool periods in the day and warm sleep wear for the night time. Don’t forget sun protection including sunglasses, sun block and hat. While snorkeling you will need a rash guard top to protect you from sea jellies, rock scrapes, and other abrasions. Please don’t over pack. A valid passport is required for all visitors to Mexico. Airlines traveling to Mexico require a passport valid for at least 6 months after the initial flight date in order to board the flight. US and Canadian citizens do not need a tourist visa to enter the country. Visitors from all other nationalities should check with their local Mexican Embassy. If you do not have a passport, apply at your local post office. Don’t wait until the last minute as processing does take some time. Passports cost $80-100 not including the cost of two head shots which must be submitted with the application. The days are typically in the high 80′s. During the day you will be in a t-shirt and shorts taking advantage of the intense sun not yet felt in the northern latitudes. At night and through dawn you will be surprised how quickly the desert cools down. It can feel cold with the wind, so make sure you bring the warm items listed on your packing list. Nighttime temps can be in the low 60′s but can feel like the 50′s if you are not prepared. No immunizations, shots, inoculations or vaccinations are required to enter Mexico from the US, Canada and Europe. Check with your physician to be sure you are up to date on your shots. Tetanus, Hepatitis, and Typhoid are all recommended. Check the Center for Disease Control’s web site for updates and recommendations. Mexico has the same electric system as the United States. Electric outlets are 120 volts / 60 Hz. On the island we will have access to outlets in order to charge cameras and other electronic items. Drinking tap water is safe in Baja Sur, though the water can have an aftertaste and visitors tend to buy bottled water. The places where we will be staying have places where you will be able to chill your water and store food. Mexican currency is the Peso ($1 US dollar is equal to about 16 Mexican Pesos). US Currency is accepted here so don’t worry about exchanging your money. Bring $100-150 USD for gratuity and about $50 in small denominations of $1, $5, $10 and $20s. Credit cards are accepted at most stores. ATMs can be found all over Baja. Keep in mind that there is a small fee for international withdrawals, though from experience it could be safer to travel with a bank card then with a large sum of cash that can get lost/stolen. The hotels you will be staying in will have safes where we can leave valuables and passports during the day.